When it was first reported in Germany that Emile Smith Rowe would likely be joining RB Leipzig on loan for the rest of the current season, we covered a report which explained a buying option was unlikely. Even that managed to instil some panic among Arsenal fans, who clearly feel the 18 year old has a big future ahead of him at the club. It quickly emerged that, of course, the Gunners hadn’t agreed to a sale option. There may be financial issues at Arsenal right now, but it isn’t so bad that selling the favourite children is on the agenda. 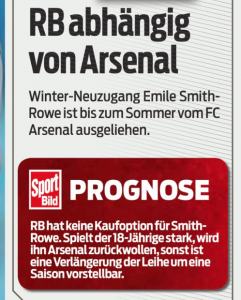 Yet despite that, Smith Rowe could continue at the Bundesliga club beyond the end of this season, report SportBild in their magazine this week. That would only be on another loan basis. SportBild explain that if the youngster impresses and has a strong end to the season, Arsenal will likely take him back. If not, and the likeliest scenario is he gets minutes here and there, then it’s explained a further loan is conceivable. That’s not so bad is it?